All black looks are effortless. That’s why I’m constantly wearing simple, all-black ensembles. A look that’s not so easy? Monochrome outfits in off-white. It’s incredibly hard to find white separates that match, and it’s a terrible tragedy if you spill something, sit on something or even brush up against something. 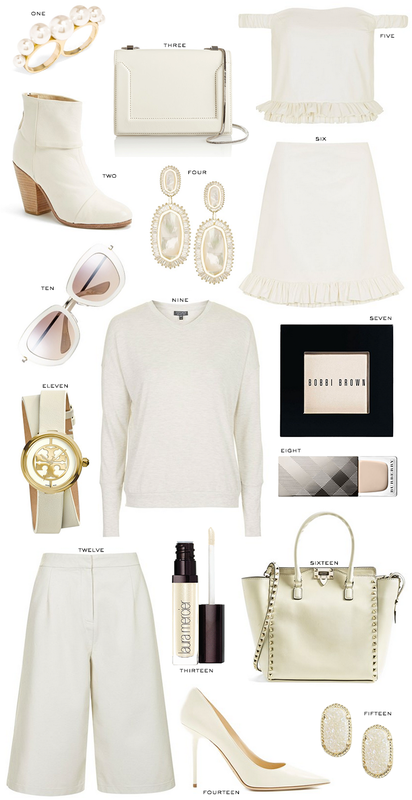 The thing is, this monochromatic creamy look is so. freaking. chic. Some of my favorite looks on my Outfit Envy board on Pinterest feature this trend. The look is so elevated and luxurious, but also youthful and fresh. I’m dying to try out this look come spring, and I’m thinking I’m going to start with this top and matching skirt from Topshop’s UNIQUE collection. The ruffled hems are too cute for words, and the whole ensemble would be adorable with an ivory moto jacket, clutch and sandals, don’t you think? I’m also on the waitlist for this pair of Rag & Bone boots. I already own them in black and tan, and think the latest off-white shade would be the perfect spring/summer boot! Love the white pumps, so pretty. Love ivory and that bag! I’ve posted this look so many times, I just love it, soft and elegant. Love that off the shoulder top! I really love the idea of a white/cream matching set (skirt and top) — I loved the lovers and friends one that all the celebs were wearing last summer! I couldn’t agree with you more!! I always gravitate to all black looks, but nothing is chicer than all white. These pieces are gorgeous, and I think I need those rag and bone booties! Gotta love an all-white look, anytime of the year! I love creams and whites. I’d love to get my hands on these shoes! I love this all! These beautiful ivory pieces are making me dream about spring! Love off white everything lately! Love the ring and sunglasses! So so gorgeous and classy! Something about the ivory color palette here is just so stunning. I’m in love with those sunnies! LOVE that frill hem a-line skirt!! So simple and chic! I wish I wasn’t a total slob because I think white looks so fresh! I have a couple pieces here and there though! That frilly cream top is so cute! I want it for spring & summer! The earrings on the bottom are my favorite! They are gorgeous! LOVE two and three – I need more whites in my life! Great post!